In sha’Allah one of my plans for this year this year is to pay more attention, take more care with my picture making, do less willy-nilly shooting, title fewer scanned rolls “Random-something-something,” and focus on building a body of work, or trying to, rather than just trying to come up with projects to keep this blog going and shoehorning those random collections of shots into 4 or 5 tangentially related posts that maybe 100 people will click through to from the effbook and that no one will comment on, even if I offer to give a present in exchange. If I want to get better at this, if I want to do something with this hobby, this blog is one part of that, but more than a blog that 100ish people look at with some irregularity, I need a cohesive body of work or three, and just cobbling together a few posts per week isn’t getting me there. Anyway… I was going to whack this roll up into 4 posts, but why? I don’t run ads and so don’t really need the clicks (though seeing the page views increase does give me some (likely false) sense of pride), so let’s lump them all together in one. I’m not sure which one I prefer. The first one has some part of another picture in the upper quadrant: I tried to do some multiple exposure stuff by pushing the rewind button and it sorta worked, but I ended up with some overlap. Some readers might be unsurprised by this, but I missed the memo. I like them both, but for different reasons: the one on the left has that subtle triangle pattern from the overlap, and the blurred-out chili in the background is more pronounced; the one on the right has the pot at the bottom and includes a bit more of the lower branch. 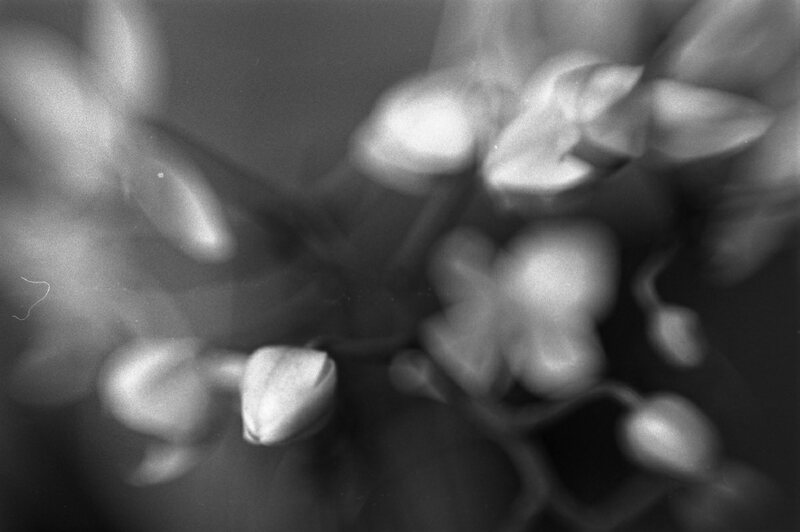 But either way, they’re both nicely blurred pictures of a chili plant. I mostly shot randomly around the house for the first half of the roll, except for three shots taken out front of the Dallas County offices while waiting for the Hanabibti to check for property tax discounts that I completely missed the focus on. Then, in sort of a fit, I burned through the last half of the roll on a brief walk to gather some kindling/firewood. I like a couple of the around the house shots the best, so I’ll save them for the end. 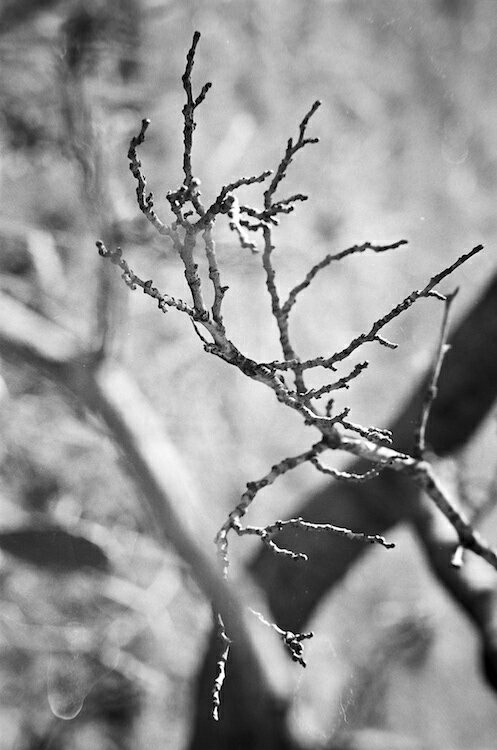 But even weeds and tangled masses of dried-up grass look pretty good on some nice, smooth-grained black & white film. And even bare limbs look pretty good. I think just the mere fact of black & white adds some interest and lends an air of artiness to pictures that would otherwise fall totally flat. (And without a good concept, they probably fall flat anyway.) 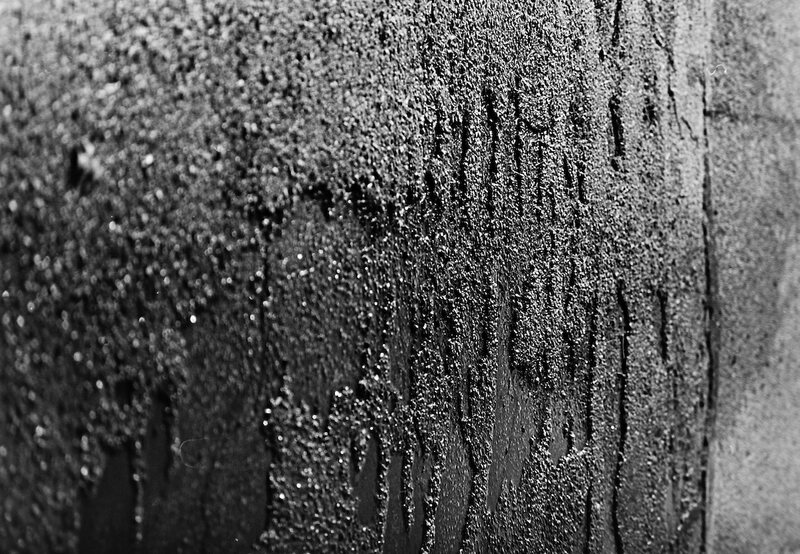 I do like the nervous, twitching bokeh in the background… there’s something almost painterly about it, and it disguises the hard water splotch nicely, don’t you think? 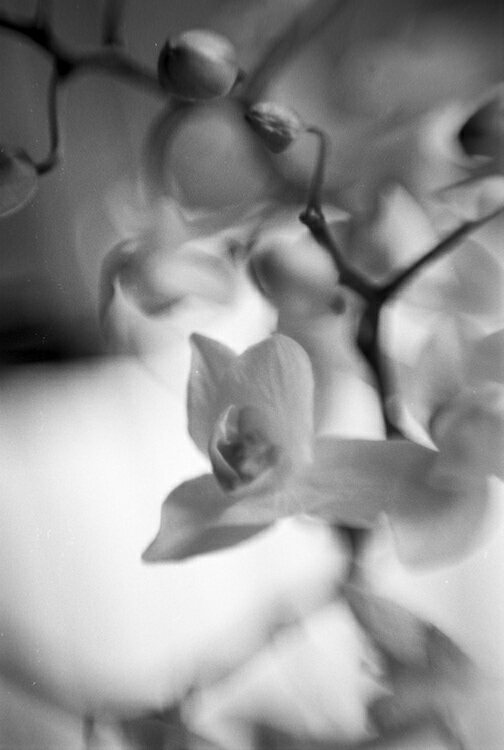 And that brings me to my favorite pictures from this roll: a couple of handheld reversed-lens pictures of an orchid my mom brought by when she was in town. I discarded this first one, but after some careful processing, it turned out ok, I think. I think it’s important, as the name perhaps implies, to have white and black represented in Black & White pictures. Too much middle gray leaves no room for any interest, doesn’t push or pull the eye around much.